An easy, evergreen way of adding some personality to any room is installing a chandelier shade. Chandeliers are regal in stance and when combined with a designer shade, they make illumination a trendy affair. From making entrances seem more welcoming to lending a touch of premiumness to dining spaces, chandelier shades help to establish a focal point. Our collection of chandelier shades will accentuate the grandeur of your living space. Alternate / innovative material options include use of jute, jars, ropes, beads, and unpolished tree branches. The James Moder Crystal Shade continues to be a constant bestseller on our online store. 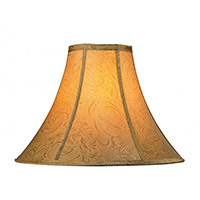 Lamp Shades There are 431 products.